I got Jaroslave Kalfar's Spaceman in Bohemia. 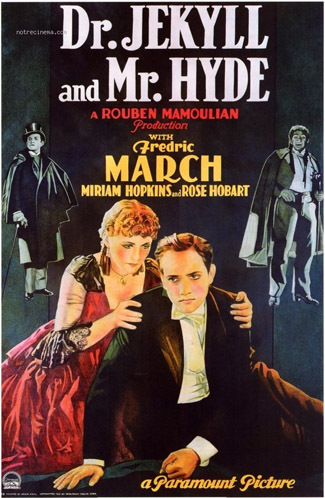 At home: Dr. Jekyll and Mr. Hyde seems like the perfect story for pre-Code Hollywood to make, and in 1931, they did, not omitting its darkly sexual elements. It's even shocking at times. Miriam Hopkins really sells the terror as she becomes the target of Hyde's mental, physical, and yes, sexual abuse. Along with a number of interesting camera work and editing - though I don't think the long POV shots really works - the film uses make-up and lighting to create the transformations (looks amazing) before going full caveman on Fredric March. But March doesn't just let the make-up do the work, he gives Hyde tics and mannerisms all his own. I'm used to werewolf movies trying to allegorize themselves into this space, but this is much more effective and troubling. Hyde is still a man, and Jekyll remembers what he did as his darker self. Remove the pseudo-science element, and you have a man who abuses a common mistress even as he courts an angelic socialite, with the abuser's self-serving remorse that comes with it, but doesn't change the man (as per his failed promise to Hopkins' character). Dark, dark stuff. 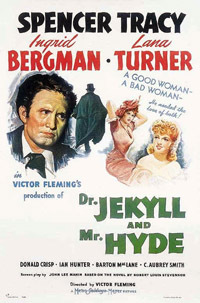 1941's Dr. Jekyll and Mr. Hyde has to be a lot tamer than the 1931 version (Hays Code and all), but isn't completely devoid of the story's dark sexuality, especially present in the surreal Freudian visions Jekyll initially sees during his transformations. But the scenes with Ivy play more as melodrama than horror, and the make-up is so simple, that the dual role is really in the playing of it. Spencer Tracy is a warmer Jekyll than most, and his wild-eyed Hyde is only a shade away, physically. It might even have been more interesting had there been NO make-up, because it comes close to being psychosomatic. Of course, Tracy's American accent is odd, though no less odd than Ingrid Bergman's cockney - both of them should go see Henry Higgins - and since I can't refuse Bergman, I shall have to let that go. This version of the film, with its slick cinematography and all-star cast is good, but pales in comparison to its immediate predecessor. 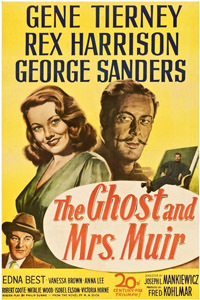 It's more intellectual and less visceral, and might not HAVE to be compared if it didn't borrow so much (including staging and set design) from the 1931 classic. Val Lewton's Cat People was about a woman, poor doomed Irena, who may or may not have been possessed by the spirit of a panther. 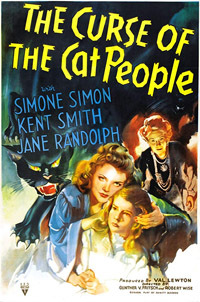 The sequel, The Curse of the Cat People, has the surviving characters from the first film get married and have a little girl, Amy, who has an overactive imagination, and summons an imaginary friend who may or may not be the ghost of Irena. 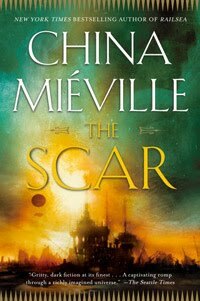 While the child lives in a kind of shadow world between the real and the fantastical, mostly benign, as many children do, the Curse is really on the father, who fears her imagination will lead her down Irena's dark path (as he never believed her malaise was supernatural either). As a counterpoint, we have odd neighbors (who may or may not be Cat People, there are clues) in a similar situation. A grown-up daughter whose traumatized mother refuses to recognize her as anything but an impostor. It's possible you will want more answers than the film gives you, but as a mood piece, it works terribly well, with nice visuals, an effective child star, and a good sense that this is a child's reality, not completely understood. Based on Apocalyptic writer John Wyndham's The Midwich Cuckoos, Village of the Damned is an eerie piece of science-fiction horror that may or may not read differently today than it did in 1960. Then, I think it preyed more on cuckolding anxiety, as alien babies are born to every woman in the village. Post-partum might have been a part of it, though perhaps not as well understood, though the child as "other" is a common horror trope when you're doing creepy kids. Today, it's hard to ignore the first act's apparent roofying of Midwich's women and subsequent anxiety faced with the impossibility of getting an abortion. And of course, there's the larger theme of parents being replaced by their children, in terms of an alien invasion. 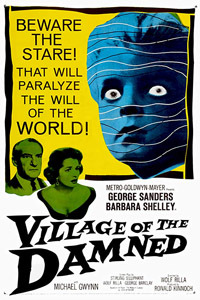 From the spooky opening when the village falls silent, to the extremely tense final minutes, the original Village of the Damned is full of effective chills despite its at times procedural plot. 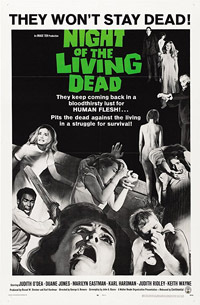 With Night of the Living Dead, George Romero created the modern zombie - and the Zombie Apocalypse - in a slick, energetic package that only at first SEEMS to be old-fashioned. The black and white treatment takes us back to a time where you couldn't expect gore, or fast, intimate camera moves, or an African-American hero. Indeed, that seems quite progressive, but it's also part of the theme. White-faced hordes are descending on him and the people he's trying to protect, and the final gut punch asks us whether you need to be a zombie to fall in with a careless, murderous posse. While you're watching, you're not necessarily thinking about all that. It's enough that there's unrelenting tension, even when you're just basically watching a guy board up some windows, and the story is given some scope through radio and television reports (that's the one flaw though, all those "live" daytime TV reports). I thought I would see the invention of a genre unfold before my eyes, but it managed to be more than that, resonating in a way its cinematic spawn rarely equaled. 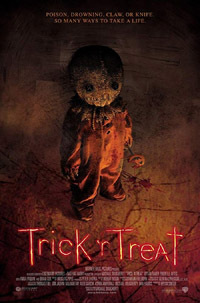 Four-and-a-half "Tales of Terror" are interwoven in Trick r Treat, a bit of Halloween fun from director Michael Dougherty who would later bring us Krampus, very MUCH in the same vein. See, if you don't have the Halloween spirit, you might very well buy the farm in this movie, usually but not exclusively thanks to its cute little monster, who I feel is immediately iconic. Are other holidays as dangerous as Halloween and Christmas, Mr. Dougherty? As to tone, it's a black comedy, with lots of fun fake-outs and twists in every story. The links between the stories are amusing too, and it doesn't really feel like an anthology film. Think of it as Magnolia for horror fans. Originally, it was supposed to have a synchronized release with a comic book, which explains the comic booky opener, but plans for that fell apart and it's just enigmatic now, as if they were playing overt tribute to old EC horror comics like Creepshow did. Well, there are worse ideas. 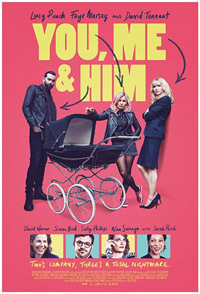 You, Me and Him is an amusing if not always unpredictable lesbian romcom produced by Georgia Tennant, and therefore, it seems, full of actors who have been on Doctor Who (including herself, her husband David, her dad Peter Davison* in a very small part, Sarah Parish, David Warner, and others). The story involves one of the couple (Lucy Punch) wanting a child, getting artificially inseminated, and the other (Faye Marsay) getting pregnant accidentally while on a bender, and of course the douchey baby-daddy (Tennant) wants to be in the child's life and disrupts their lives. At its most predictable, the one who wants a baby finds pregnancy more than she can bear, and so on, but its turns into drama are more unexpected, and the characters were well-rounded and interesting, as so often happens in British comedies of this stripe. And while it was touching at times, I let out a number of belly laughs. The pre-natal class stuff alone... If you know me, you know I'm a difficult audience when it comes to comedy - tears, I'm easy; laughs, I'm not. This one gave me both. There's something about caveman movies I am hard-wired to like. Now sure, One Million Years B.C. 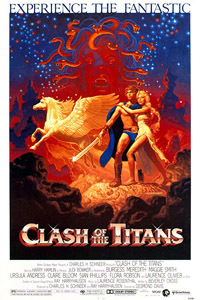 is more like a fantasy world that scrunches together all of prehistory - humans and proto-humans at different stages of development, dinosaurs, volcanic upheaval - but accepting that, I nevertheless found it compelling, and no, it's not just the buxom babes or the Harryhausen wizardry. I can't help but see it as a sociopolitical fable, one that's sadly still relevant today, about tribalism, and the clash between every-man-for-himself policy vs. a more cooperative and humane model. The story overlaid on this is a romance between members of each tribe, and THAT I don't really believe. The dim-witted brute Tumak scarcely deserves the Amazon Queen Loana, but the conceit is required for one of the "Rock Tribe" to fall in with the more advanced hunter-gatherer culture she represents. The final act is a bit of a mess, granted, and everything is almost lost because of the way Tumak "thinks". Bonus points for the gorgeous Lanzarote locations. I just finished reviewing Battlestar Galactica: The Original Series (one a week for the past 21 weeks), but to sum up, it remains watchable and iconic even if many of the middle episodes were written in an awful rush. Started off with a bang, and ended with one too. I wanted to say a few words about the DVD extras before heading into the 80s (not the most touted era for the franchise). 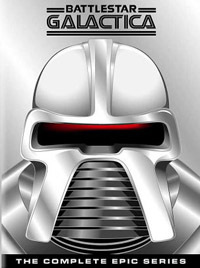 First of all, nice chrome box, even if it's all Cylon, all day. The set's best treasure is surely the many, many deleted scenes and outtakes provided on most episodes (over three hours total). In addition, there are a few interviews, making of featurettes, and a 45- minute documentary, all valuable and fun. Only one episode has an audio commentary, and that's the pilot, with Richard Hatch (Apollo), Dirk Benedict (Starbuck) and Herbert Jefferson Jr. (Boomer) lending their voices and having a good time. My one problem with the product is that it's not clear which disks are two-sided, and I often had to dig the booklet out to figure out where I was in the series. 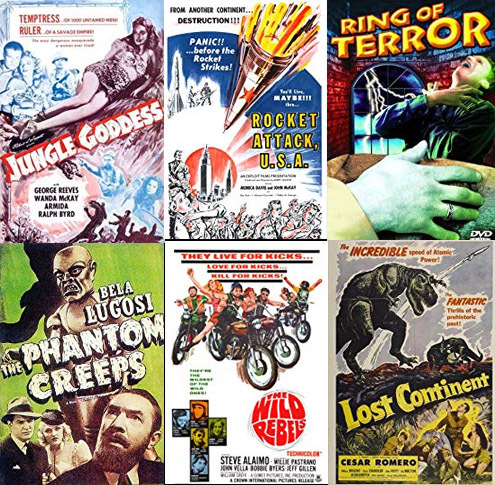 Some classic MST3K movies, regardless of comedy commentary... Jungle Goddess is an utterly racist jungle adventure with no likable characters (except the natives who, if they have lines, are black-faced performers) about a couple of colonial mooks who go looking for a lost socialite passing herself off as a deity; at 62 minutes, it's somehow full of padding, and its heart isn't even in the right place (only for forgiving fans of George Reeves). Useless even as propaganda, Rocket Attack U.S.A. is a cold war spy thriller with zero thrills, smothered in boring documentary-like voice-over, and when characters have conversations, it's the same kind of wooden exposition. Telling an urban legend about a medical school hazing gone wrong should take about 2 minutes; Ring of Terror gets to 71 by adding inept nonsense like a cemetery custodian's cat, a happenin' cafeteria dance, animal cruelty, an interminable anatomy lesson, fat shaming, and a swimsuit competition. The Phantom Creeps is goofy fun and has Bela Lugosi going for it, I suppose, but it's never happy with its mad scientist just being able to turn invisible, he also has to use giant robots, exploding spiders and death rays... and not one memorable hero to fight him (first 3 parts on MST3K, saw the rest on Internet Archive). Despite a good shot here and there, the horrendously badly-paced Wild Rebels is a motorcycle movie that just pointlessly spins its wheels. Lost Continent is about getting somewhere, looking at a few stop-motion dinosaurs, then leaving; horrendously long sequences of Cesar Romero going 'round an unconvincing mountain set. 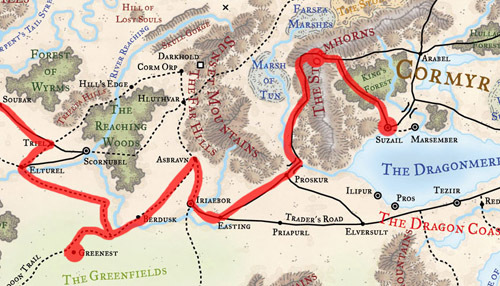 Role-playing: BARD&D Episode 4 - The Matchmakers. The theme of this adventure scenario was love! Imagine Romeo and Juliet if Paris hired an all-bard party to kidnap Juliet and marry her against her will, and then it turns into a con/heist movie to capture the bride, get her married to the right man, and humiliate the comedy villain in front of the whole capital during the big show. Our thanks to the opening act, crazy swing band Sylvanus Jitterbug & and the Faerûn Fae, played by our friend Chalif who's wanted to play in an all-bard game since forever. 'Twas fun!